North-east tourism bosses have thrown their weight behind a campaign to promote the long-awaited Aberdeen Western Peripheral Route (AWPR). VisitAberdeenshire chief executive Chris Foy and Aberdeen International Airport managing director Carol Benzie, who stepped down from her role on Friday, are both backing the #GoNorthEast campaign. Both organisations believe the AWPR /Balmedie to Tipperty (AWPR/B-T) project, which is due to open fully this autumn, is crucial for attracting more business and visitors to the region. VisitAberdeenshire, which promotes visitor experiences across north-east Scotland, has hailed the project as “the golden thread which connects the region”. Mr Foy, who recently outlined VisitAberdeenshire’s target to raise visitor spend in the area to £1 billion each year by 2023, said the project will help make the destination more accessible for visitors. He said: “We have significant capacity to grow our tourism industry and the AWPR project will play a crucial part in enabling the renaissance of region. “It’s the golden thread which runs between other major infrastructure projects in the city, such as the harbour and the AECC. “It will help build confidence in the region and make us more attractive for business and leisure visitors. “As well as offering increased connection opportunities in and around the city, the project also brings good news for smaller tourism operators in the north of the region, like the Banffshire coast, which will benefit from easier access from the south. “The AWPR is much more than a road project. Mrs Benzie said the route will make it easier for those travelling through Aberdeen International Airport. She said: “The most exciting thing about the AWPR is the fact that staff and passengers from the south of the city will be able to get to the airport very easily without having to sit in congestion in the city centre. “They can bypass all of that and be here almost half an hour quicker than they did previously. “This is one of the top infrastructure projects currently under way in the UK and it really puts Aberdeen on the map. 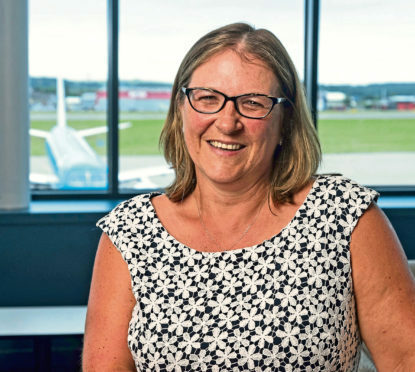 She added: “Following extensive upgrades to the airport’s retail and security search facilities as part of a multi-million-pound terminal transformation project, there’s hope the AWPR project could lead to more routes for passengers.